I went to a church dinner a couple weeks ago and they made shredded pork with an amazing guacamole salsa over it. I loved it! I was so excited when later in the night they had a class teaching us how to make the same salsa! It is really easy to make and is healthy also. It is made with all fresh vegetables & herbs ( and a pinch of salt.) It can be made thicker like real guacamole or thinner to make it like a salad dressing - and everywhere in-between. I use it to spread on my turkey sandwiches and it has a bunch of flavor without adding any fat. I keep thinking of all the other ways I can eat this - besides with a spoon! Peel and wash the tomatillos - they are usually found over by the cilantro & peppers, and have a husk on them. Cut them into quarters and put in the blender. Follow with the jalapeno, cilantro, onion, garlic, avocado & salt. 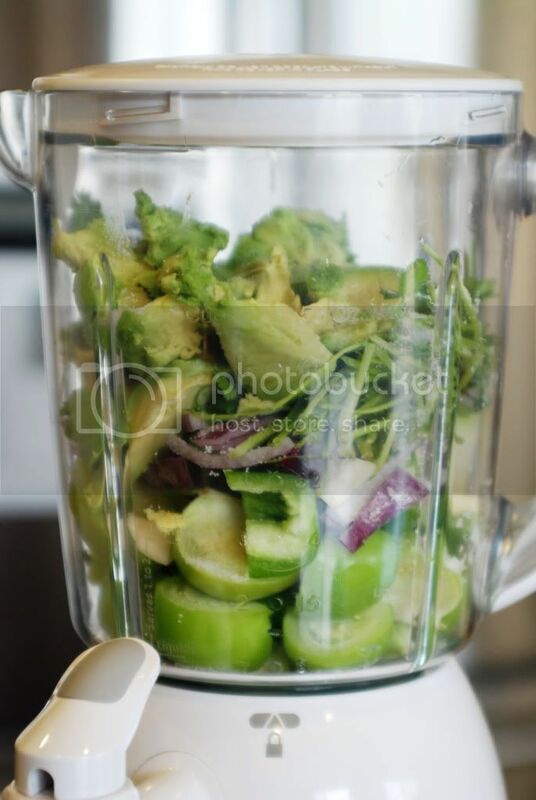 Be sure to put the tomatillos in the bottom of the blender and not the avocado so it doesn't stick to the blade. You might have to help it start by shaking or using a mixer at first. 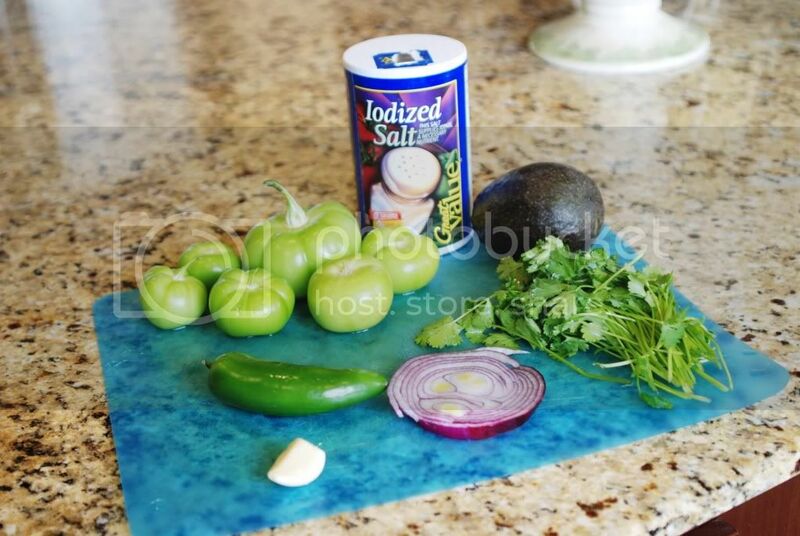 But, once it gets going the juice from the tomatillos will help move the other ingredients around. That is it! I was told it lasts for about a week in the fridge. I did notice that it thickens up in the fridge, so if you want it thinner grab a couple more tomatillos to mix in again. Super easy and so good!! I'm finding this late, but it looks amazing! Thank you so much for sharing! I just wanted to stop by and let you know I featured your gorgeous guac salsa on my blog today!! Thanks for being part of the recipe swap! I tried this salsa and it was wonderful! Thanks so much for this recipe! Thanks girls! I am glad you like it Lizzie, thanks for letting me know! This looks fantastic! I am a chips and dip addict and am currently craving avocados. Thanks for the recipe. I'm so glad I came across your blog via Craftaholics Anonymous via sneezerville. Take care! Added some sour cream in it and it is excellent!!! Tastes exactly like a salsa my favorite Mexican restaurant makes!!! Hmmm...what did I do wrong? I didn't like this at all. The tomatillos seemed to take over the taste. Are you sure you add a whole pound? In the picture you only have 6 of them and that doesn't seem like it would be a whole pound. I had way more then 6 and maybe that was the problem. I'm so glad someone said this. You absolutely cannot have guacamole without fat. But as you say, it's the gooooood kind. DH and I are avocado freaks and this will be an entirely welcome addition to how we use them. We also love tomatillos -- and get really odd looks when we buy them fresh in our neighborhood (long story) but we do. In fact, we are there on Tuesdays when they are delivered fresh. Sadly, we can't grow them in our zone, so we have to buy them. But we are growing our own salsa garden! Oh wow, thank you, thank you, thank you for sharing this recipe with us. I am on a low carb diet, and the ladies at my church are also doing a bible study Made to Crave. We are trying to come together as a church and make healthy church suppers and I am going to try this on my next turn to cook. I have just the perfect pork tenderloin recipe to pair this with. Thank you again. God bless and have a great day. this recipe is missing lime juice and/or zest. Other than that, it's AMAZING and I make it alllll the time to go with my crock pot barbacoa. So I randomly saw this, and while it is a few years old now I figured I would still mention this. My grandma taught me how to make this a couple years ago (I'm a college student) and she's been doing it for forever and learned this recipe from one of her mexican housekeepers way back when. Sweet! Thanks for the advice!! Made it tonight after seeing it on pinterest! As a fellow mommy who loves making homemade salsa in my blender i was excited to have a different recipe! Thanks! I added lime and just played with amount of ingredients to my own taste. :-) LOVE! Thanks! looks amazing! cant wait to try! I made this on Christmas Eve and it was wonderful! I could not find fresh tomatillos so used canned whole ones and it turned out great. Thanks for posting. 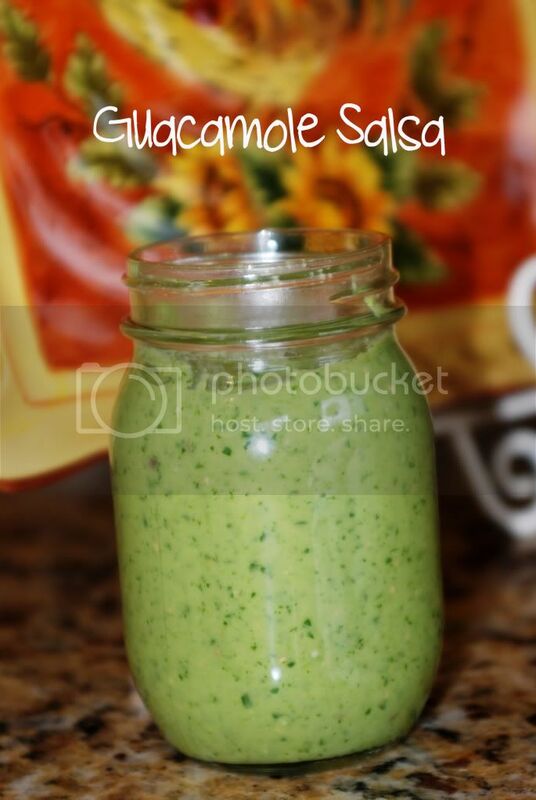 Just found this and it looked interesting since I love guac and homemade salsa. So I made it tonight and it is AMAZING!! I cannot stop eating it! I could have made it just my dinner, but that would make me look like a glutton to my kids! YUM!! I have one question.... Is this something that you can can???? It looks delish and I would love to make enough at one time for several sittings... Thanks. I am so excited to find this! I will eat anything that has an avacodo in it! I am making it RIGHT away! This looks super delish. I found it on pinterest. I must make it. thanks for sharing. What an awesome recipe. I love all the variations. And who doesn't like avaocados?? Found this on Pinterest. I've made it multiple times this week on request of my husband and kids. We looove it! Looks good, I have 2 ripe avocados in my fridge but no tomatillos, can I substitute with tomatoes? I'll have to find the greens ones I guess. I live in Texas and this stuff is at all of the Mexican restaurants and WE LOVE IT! I've been looking for a great recipe for awhile now! Think I just found it! Thanks! Found you on Pinterest! I made this tonight and served it on top of pulled chicken tacos with cheese and black beans. Delicious! You know avocados are full of fat, right? So using it as a low fat spread isn't really possible. Delicious, yes; low fat, no. Thanks so much for doing this & letting us know! Though avocados are high in fat, it's the good fat, thus good for you, therefore that's why they are so hugely popular!!! Thanks for this!! I have been trying to duplicate the avocado salsa at El Pollo Loco and this sounds just about right!! I made this earlier this week and I LOVE IT!! It's fantastic! THANK YOU for posting!! I'm a salsa LOVER and this is such an easy recipe to make and different than what is out there. I really like that it's 100% natural and that you can add different spices/flavors to it if you choose. I'm a fan! Thanks!! I found your recipe on Pinterest and made it today...it is SO good! Thanks so much for sharing! I have a similar recipe (which I love) but can't wait to try yours. If you ever want to try a fun variation, my recipe calls for all the veggies/pepper (but NOT the avocado) to be grilled first. The grilling brings out a great flavor. Then add the avocado and process away! I grilled some avacadoes the other day - cut in half, seed removed, sprinkled with some sea salt, garlic powder, and cayenne, and grilled them on indirect heat (skin side down) for about 45 minutes, and they are DEE-LICIOUS!!! I recommend giving that a try, and then processing everything! That is a great question & I am not sure. I have not tried it with regular tomatoes. I am sure it would still taste good, but would be a completely different salsa. The tomatillos have a much different consistency, flavor and feel to them than regular tomatoes. How fun that you get to live in Germany! If you give it a try let me know how it tastes! Thanks! You could use green tomatoes and they would have a similar flavor to tomatillos, but not red tomatoes--hope that helps! That sounds great! Sometimes I add two avacados to mine also. I am going to try the lime juice! Just made this this weekend - delish! Thanks so much. Just made it and covered my pork shoulder in the crock pot! Mmm! It's awesome that it lasts a week. A scoop of this will taste great with chorizo, peppers, and onions (my usual breakfast). Ohhh! Such a fresh taste! Move over Snapple, Guacamole Salsa is the new "stuff." Just made this...I am addicted!!!! Thank you for the recipe. My husband makes this all the time, one of my kids favorites. He got the recipe from his uncle who was from Guadalajara. It also makes a great salad dressing, sauce over chicken, or for green enchiladas, over fish...! I make this only I roast the tomatillos and peppers under the broiler for 5-6 minutes. It,s wonderful when added to ranch dressing!! Just found this on Pinterest, and I have to ask, does it really last a week?! I love to make guacamole, but you have to eat it that day or it turns brown. If this really lasts that long, I can't wait to start making it!! I already make homemade salsa, and love the idea of making this too! Just made this!!! New fav!!! "I use it to spread on my turkey sandwiches and it has a bunch of flavor without adding any fat." This Salsa can be "canned" in the same manner as Ketchup - in a hot water bath. Check the Ball Canning company, http://www.freshpreserving.com/home.aspx, they have the instructions you need. If you don't already have the equipment, Wal-Mart carries a good selection of implements. I've done a lot of canning, and it's quite simple. Good information on the fat content of different types of avocados. Just wanted to say "thank you" for posting this. It won First Place in our State Fair last month. My friends and I are addicted to it. "Unknown, October 8" and others that love this recipe. Did you change anything from the original recipe? I like the idea of broiling the tomatillo's or boiling for 5-6 mins. I would like to make this for Christmas gifts with a nice red ribbon. Guacamole Salsa has always been my favorite. So excited to be able to make it myself. Thanks for sharing!!! I had this at a restaurant about two weeks ago and have been searching for the recipe ever since. I found your recipe via Pinterest. So glad I did! This is exciting! There is only one Mexican restaurant that I've found around Memphis with guac salsa... this looks just like Alfredos. Can't wait to try it! SO, it will not turn brown in the fridge??? I hope that is the case. If so, It will become my new best friend! I add two avacados all the time! That is one reason I love this - sometimes I want it thicker and sometimes thinner. I make it constantly and it has never turned brown. Glad you like it too!! A quick FYI.... NO it does not turn brown. Mine is on day 2 and it is so good I doubt it will last around here another day but so far it has not turned brown at all. This recipe sounds amazing. I do a lot of creative cooking. So this recipe will be my new experiment. First I'll try your original version. Then I will try Roasting the tomatillos the peppers and garlic before processing. I love the flavor of roasted garlic. Can't wait to get started. Thanks for sharing. I wish your posts had a print option for the recipes. We will be making that today. I started making this salsa because of your post, and have been making it every since (2+ years). Many people who taste it say they hate guacamole, but like my green sauce (I don't tell them it has avocados). It's a hit for every tailgate, pot luck or taco night we have, so thank you for sharing this AMAZING salsa recipe!! If you want to print, highlight what you need and then paste it into your text editor or Microsoft Word. I wonder if this could be canned? I just made this salsa. It is very salty. Can I fix that in any way?